Question Im having issues with riot games' NA server can you help? Hi. i was hoping someone can help me with this issue. Over the last 2-3 years ive been having a problem with league of legends and latency. ive had the same isp ever since and everyone locally with the isp who plays league of legends has the same problem. The isp name is Columbus Communications (Flow) Located in Trinidad. The problem is that everytime i connect to the north american server i get 1 of 3 different latencies. its either 98, 110 or 150. Each one is constant throughout the whole game depending on which i get. I have messaged both the ISP and Riot Games and neither have been any help on resolving this. Recently ive started using a program called "Haste". This is a paid for program but i cant afford to keep buying a subscription, Using this program the ping drops to 102 but i still feel some of the lag, as thought its just an illusion. I dont feel any lag if im lucky enough to get the 98 without the program. This hassle has went on years now and i need help please IF anyone can Thank You! Sorry to say this to you, but from a bit of googling, it seems like NA servers are hosted to the Chicago. And its pretty long way. And another issue is, is your ISP doing via mobile network your internet or it has wired connection? That has pretty big impact on ping. From my theory is, that your (If you live on island) network provider havent putted cables for network in the sea (25km?)? You could use Softether VPN (Which is free VPN software) and pick server closest to the between those 2 servers in NA and test out. A bit of a hassle to setup, but its pretty neat program cause people are hosting VPN's across the world. So first you have to set your exception correctly. Lets say we could drag a magic optical fiber to your house and directly connect it to the data center in chicago. The absolute best possible times you are going to get is 30ms and even this is a high number because light travels slightly slower in fiber than it does in a vacuum. There is nothing you can do to affect the path your data takes since there really is no direct fiber between your house and every possible data center. When you live on a island country it makes it even harder since fiber only goes where they run it. You are somewhat lucky there is lots of fiber in the area. 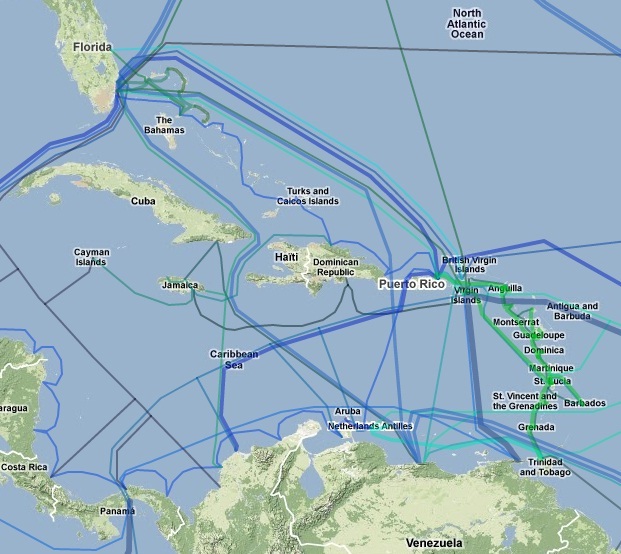 Still if your fiber path would run via Venezuela you could have issues. The other day when they had the power issues the main fiber interconnect went down. I was told the generators ran out of fuel since the power was out for so long. You can nothing to affect which path your data takes. If you had a stupid ISP that only leased service on the undersea cable to say brazil your traffic would have to go all the way to brazil and back. Your only option is to choose a better ISP. In effect that is what you are doing with that HASTE company. I have never heard of that one but it is basically a form of VPN. They directly lease fiber connection from other vendors with the goal to improve game latency. Unlike a ISP that has other concerns...maybe facebook or netflix.... these companies buy direct connections based on games. In effect they are buying a fiber between your house and the data center. The reason they have to charge money for this is they are paying extra to get more direct paths and dedicated bandwidth. You are very lucky that you found that company. It is very hit and miss if these type of companies will reduce the bandwidth. It all depends on where there private network runs. If it does not go to your country they you will see no benefit in using it.